Superman is dealing with a Time Tsunami when he is suddenly drawn into a portal. Supergirl and Superboy join him but neither knows why or how they got there. The heroes notice that they are in the presence of the Oracle and Superman demands to know if the Oracle is capable of stopping the Time Tsunami. Instead of answering the Man of Steel's question the Oracle simply points and the trio is shocked to see a very much alive and very much not blown up Krypton. Kara rushes to investigate the planet but Superman suggests she be more cautious, which turns out to be the right way to go as the floating city they were flying towards attacks them. Suddenly they are transported to one of Krypton's moons where the Oracle possesses Superboy and tells them about the dangers they face. Superman and company thought they defeated H'El but in reality they simply sent him to the past where he learned his true origin. That revelation drove him insane and he killed Jor-El. H'El's goal became to rule Krypton and prevent its destruction. To that end he moved through time and space and along the way created different realities. He corrected his mistake of killing Jor-El and in one world the two became quite close but no matter what they did Krypton always died until the one day the many Jor-Els solved the problem once and for all. Supergirl sees that the Oracle's possession is hurting Superboy so she breaks the connection. Superman is surprised by her sudden concern but before they can discuss it further a woman named Faora finds them. Supergirl is less than thrilled to see her as Faora was considered by many to be a terrorist, a traitor and worse. All of that is in the past she assures them because only by working together can they stave off the impossible, here and throughout the rest of time. After another tremor Faora explains that after her Lord Zod was killed she was without purpose. When H'El destroyed the Oracle's herald the Oracle needed arms and legs on the ground so he educated Faora which ultimately changed her. She then shows them how H'El has saved Krypton only to damn its people to a life of servitude. Superman realizes that the only way to save Krypton is to stop the Time Tsunami that H'El created. Faora agrees and adds that the three of them need to go back in time to the reality that started it all and make sure that Krypton follows her original destination. Superboy tries to attack H'El's forces but is blown out of the sky. Faora holds off the attackers allowing them to enter the three time portals Oracle has opened. They are each charged with a different mission and after an emotional good-bye Superboy and Supergirl fly into their portals. Superman notices that H'El has arrived but Faora sacrifices herself to allow Superman to go through his portal. Superman finds himself in Kryptonopolis a few months before the planet's destruction. Supergirl is transported to the wilds of Krypton during the Great War where she is immediately attacked by a group of clones. Superboy is transported to Argo City to watch over Supergirl and immediately runs into a younger Kara. Back on Kryptonopolis Superman enters the House of El and is shocked when he is attacked by his own mother. 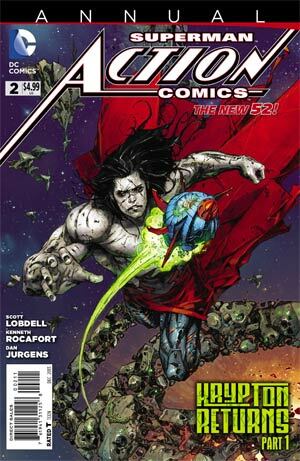 Back on Krypton's moon H'El uses his abilities to see what Superman and his comrades were up to. He discovers the Oracle's plan but is unconcerned. Time is on his side and Superman, Supergirl and Superboy are already dead. Story - 3: Quick admission right out of the gate; I wasn't looking forward to this story. I was disappointed with how H'El on Earth played out so a sequel to a story I ended up not liking didn't exactly thrill me. I was willing to give it a chance because I have learned over the years that sometimes stories I am dreading end up being at the very least entertaining and at best a really fun read. After reading this first chapter of Krypton Returns I have to say that I don't have high hopes for how this story is going to play out. It was a little annoying that a story that is going to play out in the pages of SUPERMAN is kicking off in an ACTION COMICS annual. This goes to the heart of my problems with the Superman titles as of late. Stories are starting in one book and randomly continuing in other books and while I didn't mind it all that much for Psi-War the fact that it is becoming a habit is annoying. To be fair no one is being forced to buy anything here because DC isn't holding a gun to our heads but at the same time it seems a little funky to have the chapters bouncing between titles. If this was done by design or as a means of tightly linking the two books I'd probably be down with it but the random nature of where the stories end up is a bit irksome. Beyond the logistics of reading Krypton Returns the story just isn't very exciting. Part of me feels like I should be all keyed up over Superman, Superboy and Supergirl bouncing through time and space and trying to ensure that the timeline plays out as it should because the idea that they need to let Krypton die is compelling. I also feel like I should be excited that we're finally getting to see the payoff to the one page teases from the zero issues from 2012. The problem is that this opening chapter was confusing. Things happen without any sense of context. Superman is fighting a Time Tsunami at the beginning of the issue and while that's a cool idea there was no set up for it in this issue. The explanation of what H'El is up to felt like an issue recap rather than us learning about it for the first time. I was also a bit disappointed that the major cliffhanger of H'El killing Jor-El at the end of his Villain's Month issue was rendered null and void by the revelation that he went back in time and prevented it from happening. We're being told that certain events happened but without "living" through them they lack any kind of emotional resonance. Finally, the idea of Superman and friends splitting up and dealing with the problem from different time periods feels like the old G.I. JOE series from the eighties where Cobra would attack at different points on the globe and the Joes would have to split up and fight them on different fronts. Sure it's a plot but not a very exciting one. The real problem I have is that I really don't like H'El as a character. He wasn't all that much to write home about in H'El on Earth and after reading his origin issue during Villain's Month I found that I liked him even less. There really isn't anything to him as a character and because of that anything he does holds little interest to me. Part of me hopes that I am wrong about all of this and that Krypton Returns ends up being an emotionally charged story that goes to the heart of Superman, Supergirl and Superboy and that the resolution is exciting and leaves me satisfied. Given how the last H'El story played out I am not holding out hope that it will. This is nothing against Lobdell as a writer because I have liked a lot of what he has done with Superman. I'm just not feeling this one. Art - 4: While Kenneth Rocafort's style is slowly growing on me I still don't care for the scratchy nature to his work. There was no inker listed in the credits so I am assuming that the pencils are being colored directly without an inker to provide the type of depth I like in comic book art. I was impressed with the page layouts and even liked his take on Faora. Dan Jurgens' pages were a real treat but then again I am a mark for his work. I especially liked the scene where Superman is confronted by his mother. The conflict on Superman's face was amazing and sold that scene. Cover Art - 3: This is a very average cover. H'El chasing Superman's rocket ship is an interesting idea and plays into the themes of Krypton Returns well enough but the art doesn't set my world on fire. I can't say I hate it but I also can't say I like it all that much.